Heat oven to 350°F. Spray 9-inch nonstick springform pan with cooking spray. In medium bowl, mix cookie crumbs and melted butter, mixing well; press mixture in bottom of pan. Bake about 10 minutes or until firm. Cool 10 minutes; place in freezer 5 to 10 minutes or until completely cool. Reduce oven temperature to 300°F. In large bowl, mix cream cheese and sugar on low speed until blended. Add eggs, 1 at a time, on low speed. Add yogurt and flour; mix until blended. Spoon batter into cooled crust; carefully spread over crust in pan. Place cheesecake in oven with pan of water on oven rack below it (to prevent cracking). Bake 1 hour 15 minutes to 1 hour 25 minutes or until center is set. Remove from oven to cooling rack 10 minutes. Without releasing or removing side of pan, run metal spatula or knife alongside edge of cheesecake to loosen. Cool 20 minutes. Refrigerate at least 3 hours until chilled. Remove side of pan; leave cheesecake on pan bottom to serve. 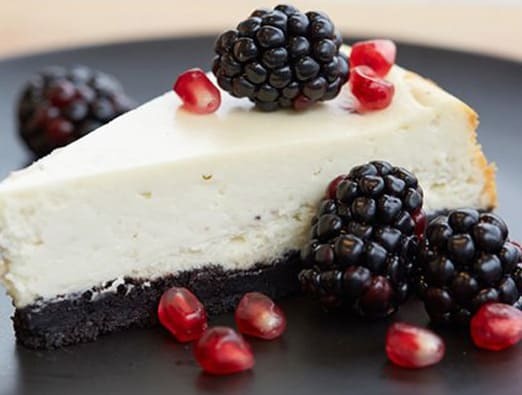 Top center of cheesecake with blackberries and pomegranate seeds.